BUCHAREST, Romania (AP) - As President Ion Iliescu and President Bush enthusiastically addressed tens of thousands of Romanian citizens braving a steady rain to participate in the occasion, the American gazed with delight at the sky. On the east side of the square, a rainbow soared even as sunset fell and the western sky turned orange. 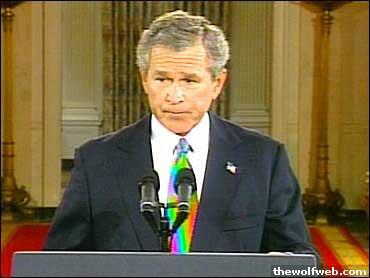 "As we started speaking, a rainbow appeared," Bush told the crowd. "God is smiling on us today." Why do you thinkthey keep Jesse around? MRS. BUSH: Thank you all very, very much. And thank you very much, Emy Lou and Mimi, for the really beautiful award. I'm so thrilled to be here. I've really looked forward to today because I know out in this room are so many friends of mine. I'm probably not going to have a chance to visit with any of you, but it's just great to see you and thank you all so much for being here. I'm so proud of the work that all of you have done to start all these community partners all the way around the state of Texas, over 100 in cities all over Texas. I think that's so great, and I'm so happy to be here today with you -- especially since I have such a busy schedule, according to a group of kindergarten students who wrote to me. Their teacher asked them, what do you think Mrs. Bush does all day? Of course, what I really get to do is to be here with you to call attention to such marvelous work that every one of you have done. Whenever I come home, I'm always amazed at how big everything is here -- the open skies, the endless fields of wildflowers, and the compassionate hearts of volunteers. Texans are good people who care about each other and care about our future. We've always believed in neighbor helping neighbor and you carry on this legacy of compassion by helping the most vulnerable children. Every child deserves to grow up with love and security. For many of us, our childhood was a happy time of our life. I grew up in a community where neighbors looked out for each other and for their children. In the summertime, we'd play outside until the last rays of daylight peeked over the horizon. And if my daddy didn't come looking for me by dusk, there was always a neighbor telling us to hurry home. But not all children grow up in a family or a community where they feel safe and loved. Every day, thousands of children are mistreated by their parents or their caregivers. About three children die daily in America as a result of abuse or neglect. Nearly 200,000 cases of child abuse and neglect are reported in Texas every year. Sadly, thousands more probably go unreported. These are heartbreaking statistics that caseworkers at child protective services face every day. But thanks to many of the people in this room, they don't have to face them alone. Today, caseworkers have dedicated partners in communities across the state. Fifteen years ago, a group of good friends in Dallas started Community Partners to support caseworkers and children. Caseworkers don't just work from 8:00 a.m. to 5:00 p.m. They may need to rescue a child at midnight or help a family escape an abusive situation at 3:00 a.m. They often have caseloads of 30 to 40 children who need food, clothing and medicine. Many caseworkers spend their own money and their valuable time looking for these items for their clients. So Community Partners sprang into action. We opened Rainbow Rooms in CPS offices so caseworkers could go any time of day to pick up clothing, formula, and even a new duffle bag so children don't have to carry their few belongings in a garbage bag. Emy Lou is a founding member and one of my very good friends. Her experience with one little boy inspires her to open more Rainbow Rooms across the sate. Emy Lou remembers this little seven-year-old boy who arrived at the Rainbow Room in Houston, scared and shy. She tried to comfort him with a teddy bear and then some crayons and finally some toy cars. But the only thing he wanted was a toothbrush. He had never had one. Because the first Rainbow Room in Dallas was such a success, dedicated volunteers have taken Community Partners across the state and now opened more than 115 Rainbow Rooms. This is an incredible accomplishment. And your dedication is making a remarkable difference for children -- and for caseworkers like Joan from Fort Bend County. When Joan went to investigate an abuse case, she was appalled to find the house littered with trash and beer bottles. The mother who answered the door reeked of alcohol. The house was dark and cold because the electricity had been shut off. Two young children huddled together under a filthy blanket to stay warm. A baby was crying in his crib. His diaper hadn't been changed all day. Joan knew that she needed to take those children to safety. She was able to go to the Rainbow Room in Rosenberg where she found diapers, clothing and toys to comfort the children. Before the Rainbow Room opened, Joan had to find a 24-hour store that carried all the items she needed, and she'd pay for the food and clothing herself. All of this from someone who is on call 24 hours a day and makes less than $35,000 a year. With Rainbow Rooms, Community Partners support more than 2,800 caseworkers and more than 50,000 children like Marcus. Twelve-year-old Marcus ran to his neighbor's house in the middle of the night. His stepfather was beating him with an extension cord. He was wearing jeans that were well above his ankles. His t-shirt was too small and it was ripped. The volunteers at the BEAR room gave Marcus a clean shirt, a new pair of jeans and new sneakers. After he got dressed, Marcus asked if he could take some shoes to his sister, who didn't have any. A month later, Marcus came back with his sisters. He wanted to make sure they thanked the volunteers for their new clothes and shoes. The BEAR room in Harris County, which stands for "be a resource" for CPS, helps over 1,000 children every month. Volunteers at the BEAR room also found a new dress for 12-year-old Angela. When Angela's caseworker picked her up at school to take her to her dad's wedding, she was shocked to find her wearing blue jeans, scruffy tennis shoes and a bandana wrapped around her ponytail. So she called the BEAR room in a panic. They quickly found a pretty pink party dress and a pair of dress shoes. Angela went into the dressing room a tomboy and came out a princess. She grinned from ear to ear, excited to be wearing her first pair of real high heels. The volunteers also found a necklace and earrings, and they replaced Angela's bandana with a pink ribbon. Her caseworker said that Angela was the belle of the ball, and the volunteers felt like fairy godmothers. Rainbow Rooms are so successful because of the extraordinary work volunteers do, volunteers who are devoted to helping children. Nearly 5,000 Texans volunteer with Community Partners, volunteers like Ann Schooler, who has spent a lifetime helping others. Ann started volunteering when she was seven years old by raising money for the war effort. In the last 60 years, she has volunteered at Sunday school and for the Girl Scouts and the Boys and Girls Clubs. She has served on nearly 40 nonprofit boards and consults pro bono for others. Ann joined Greater Texas Community Partners to help educate more Texans about child abuse. She was shocked by the horrific story of an eight-year-old girl who was chained and locked in a closet for years. Developmentally, she was the size of a three-year-old. Ann had a granddaughter the same age. She was compelled to get the word out and to encourage her fellow Texans to help children. This month, we're encouraging more Americans to join Ann and volunteers across the country. During Child abuse Prevention Month, we renew our commitment to call attention to child abuse and to protect children from harm. Child abuse and neglect are not simply family issues, but they are concerns for every American. Children suffer the pain of abuse and so do their families and neighbors and communities. This is a Round UP lunch for a reason: We need to round up more volunteers to ensure that every child has a chance to grow up healthy and safe. There are so many ways you can help. Volunteer to collect and donate clothing at your local Rainbow Room. And remember, the Rainbow Rooms have new clothes. These children have already had hand-me-downs. Or serve a dinner to children in a crisis center. Invite a caseworker to your PTA group to talk about child abuse. Establish a parenting support program in your neighborhood or repair homes for disadvantaged families to make them more livable for children. Host a baby shower and invite your friends to bring diapers, formula and clothing for infants and young children for your local rainbow room. Put together a housewarming basket of linens and dinnerware for foster children who are growing up and ready to live on their own for the first time. You can even become a mentor or open your house to a foster child. We can all help in big ways or small. One person alone can't do everything, but one person can do something. Volunteering is central to the American character. And it's a fundamental expression of our citizenship. President Bush loves this story that was told to him by Pastor Tony Evans of Dallas. Pastor Evans said, there was a man who had a crack in the wall of his home so he hired a painter to cover that crack. But two weeks later, the crack reappeared. And so the man sent for another painter and he painted over that crack. But once again, it reappeared. Finally, he found a wise painter who said, sir, you'll never fix that crack until you fix the foundation. Each one of you strengthen the foundation of America and President Bush and I appreciate all you do to protect and comfort children. Together, we can make a difference in the lives of American children. The One world Illuminated Odor. about the true NESARA law and the new Rainbow currency. been printed including: $1s, $5s, $10s, $20s, $50s, $100s, and $500s U.S.
notes are sitting on shelves waiting for the true NESARA law announcement. 2) the Bush gang who are trying to implement their ‘new world order’ plans. to have been announced at 10 a.m. EDT on 9/11/2001. the destruction of the White Knights’ Naval Communications Center. currency during the transition period, so too will merchants in the U.S.
including Safeway, Wal-Mart, and others be distributing the new U.S.
Nestled into a hillside on Leroy Place in downtown Washington D.C., adjacent to the Embassy of Guinea and a few steps from the Nepalese and Colombian delegations, sits a diplomatic mission of a different sort. The flag flying high outside this four-story, refurbished brick building could easily be mistaken for the mark of an African or Asian embassy, dozens of which dot the upscale, tree-lined area. But this particular flag is no country's emblem. It is the symbol of American Friends of Lubavitch - the dynamic Brooklyn-based hassidic movement also known as Habad. The heart of Embassy Row might seem like an unconventional place for the Lubavitch movement's Washington headquarters, but Rabbi Levi Shemtov, the Washington director, is hardly a conventional guy. And given the nature of his job, the location could not be more appropriate. For seven years the 32-year-old father of four from Philadelphia has carried out Habad's traditional mission of making Judaism available to the unaffiliated, especially to young, time-strapped Jewish congressional aides who, swept up in Washington's political whirlwind, frequently lose touch with their heritage. "In political Washington, it's very easy to get caught up in your day job," says Ari Fleischer, Republican presidential nominee George W. Bush's spokesman, who met Shemtov while working for a Republican senator from New Mexico. "Your focus can wander from your religion. He made it easy for me to find even more of a Jewish life on the Hill." Adds Thomas Kahn, House Budget Committee Democratic Staff Director and a frequent guest at Shemtov's Shabbat dinners, which famously bring together Jews who could be natural political adversaries on CNN's Crossfire during the week: "There's nobody who is more widely respected and warmly received in Congress, the administration, and the diplomatic corps. A large part of it is just his force of personality and also a tribute to Habad." But beyond reaching out to staffers, spreading yiddeshkeit via construction of a succa and menora on the National Mall, hosting an annual Purim reading on Capitol Hill, or offering High Holiday services free of charge or membership fee, Shemtov has become known both as a fixture on the diplomatic circuit and one of the most savvy politicos in town. "If he didn't have a faith-based calling," says Fleischer "he would be one of the premier lobbyists." SHEMTOV'S FUNCTIONS seem limitless. Some days he can be seen in the halls of Congress, cornering a legislator on an issue of concern to one of the 560 Lubavitch centers spread across the US. On other occasions, he arranges meetings between legislators and Habad visitors from their home state, or helps a puzzled senator's aide draft an appropriate greeting to send for the opening of a new synagogue or yeshiva somewhere. But even more often his eye, or, more precisely, his ear (his mobile and office phones provide a constant blare), is attuned to problems facing shlihim abroad, emissaries of the Habad movement, from Lithuania to Latin America, who were sent by the late Lubavitcher Rebbe Menachem Mendel Schneerson, to sustain Jewish communities in some of the most remote parts of the planet. These troubles have led him to accumulate a Palm Pilot-full of contacts that have nearly exceeded the machine's two-megabyte memory capacity and to nurture relationships with dozens of ambassadors and State Department officials - and have turned him into a regular, if not obligatory, invitee to dozens of dinners, soirees, and ceremonies around town each week. "In a certain sense he plays a role of quasi-diplomat," says Nathan Diament, director of the Union of Orthodox Jewish Congregations of America. Until last year, Shemtov held most of his power meetings over a meal at home, or at the Jewish Community Center's dairy restaurant. Then the first kosher meat restaurant, L'Etoile, opened in D.C., where Shemtov can be seen four or five times a week at his specially-reserved table. "Shmoozing," Shemtov says, "is one of the most important things you have to know how to do in D.C."
Talk to Republican and Democratic congressmen (both Jewish and non-Jewish), ambassadors, State Department officials, policy wonks, and Jewish leaders envious of his access to people of power, and they will all tell you the same thing: he is one of the best political operators in town. So good that Democratic vice presidential nominee, Senator Joseph Lieberman - who referred lovingly to Shemtov as a "younger brother" - quipped memorably at the opening of the new Chabad building last year, "As I watch you negotiate the various politicians, my gratitude is that you didn't move to Connecticut and decide to go into politics." IT IS a typical Monday in Shemtov's office, only today he has asked his assistant to hold all calls, except one from his father Avraham. Before Levi moved to D.C. in 1993, his father ran the operation from his base in Philadelphia, visiting once or twice a week, sometimes accompanied by his son. Inside his sun-drenched office, one finds a casual mix of the ethereal and the earthly. Jewish texts and writings of the rebbe are stacked neatly on a bookshelf that features photos of Shemtov alongside politicians including former Republican Speaker of the House Newt Gingrich, a close personal friend. On the walls are pictures of Shemtov and a bipartisan array of other VIPs including President Bill Clinton, Vice President Al Gore, and former prime minister Binyamin Netanyahu. A new super-slim Samsung computer monitor, a gift from his Australia-born wife Nechama, sits atop his beautiful, dark wood desk. Beside it lies a charger for the cell phone that hangs on his belt beside his pager. Shemtov's assistant enters hurriedly and places a paper with a sketch on his desk. "I think it has to have the honey dripping into a shofar," Shemtov points out, running his finger across a draft of an advertisement for Rosh Hashana services that will run in local newspapers - just one of the many details that pack Shemtov's days and nights. One day in Shemtov's office illustrates the sometimes chaotic nature of his work. Five minutes after he sits down, the phone rings. It is the Habad emissary in Uzbekistan asking Shemtov when he is coming to visit. A few months ago the Uzbekistan government would only grant the Lubavitch a 30-day visa. Aware of the problem, Shemtov invited the foreign minister to a catered lunch when he was in town. At the meeting, Shemtov recalled his special fondness for Uzbekistan, through which his family had escaped the Nazi genocide. He brought up the visa problem, an issue about which the minister had gotten an earful during meetings at the National Security Council, the State Department, and the American Embassy in Tashkent. THE FOREIGN minister promised to take care of it and the next morning the shaliah in Uzbekistan called Shemtov to thank him. He had received a visa for one year. The next call is from Moscow, wondering if Shemtov will be coming to the dedication of the new Lubavitch community center with featured speaker, President Vladimir Putin. Shemtov pulls out a massive file on Moscow, and eyes a note to himself on his desk, a reminder to get a letter of congratulations from Republican Congressman Ben Gilman and Democratic Congressman Sam Gejdenson to take with him on the trip, a small but crucial detail, he says. "They were there to condemn the Russian government when things were wrong, so now we should ask them for congratulations when things are right," he says. From beneath the pile of papers, Shemtov pulls out a pamphlet on the October conference on looted assets to be held in Lithuania, which he is considering attending. But he has more than Holocaust-era property on his mind. The Lubavitch rabbi in Vilnius is struggling with local authorities to reclaim a synagogue/school that was seized by the Nazis, which is now owned by the government. Roughly 120 Jewish children study in a different piece of prime real estate in the center of town, which the Lubavitch would happily trade for the old synagogue. Shemtov will lunch with the Lithuanian ambassador tomorrow to see if he really needs to make the trip. Next up: Slovakia. Residents in Bratislava, which does not yet have enough children to establish its own school, want to send them to religious institutions in nearby Vienna while still receiving credit from the Slovak school system. To do so, the Education Minister needs to give a waiver. In a few hours, Shemtov will attend a reception sponsored by the Slovak embassy to try to sort things out, but a trip will probably be in order. Next week's schedule is starting to take shape. Moscow on Monday. Tuesday to Ukraine for a separate yeshiva dedication. Wednesday night to Bratislava. Thursday to Vienna and Friday back home in time for the Sabbath, complete with services and 20 guests for dinner. As the day progresses, calls come in from a different set of time zones. One from Chile, about an attempt by Latin American Habad branches to put together an anti-poverty network, is followed by another from Argentina, about the upcoming Argentine president's visit to Washington. Then a local matter - a New York rabbi wants to arrange a weekend for Jewish singles in D.C. after the High Holy Days. WHILE intrigued by politics as a boy, Shemtov's interest in the intersection of religion and public life began in Australia, where he studied for his smicha, or religious ordination. At only 19, he organized a massive Hanuka celebration to coincide with Australia's bicentennial. He arranged for a 30-foot menora to be placed on the prime minister's lawn and chartered airplanes painted with a rainbow-colored "Air Hanukka" logo to fly Jews to the capital, Canberra, where few Jews live. Shemtov remembers the excitement of meeting his first world leader. More than a decade later, he is in regular contact with a few dozen ambassadors. Twenty-five, he says proudly, came to the Habad building's dedication, which was also attended by Lieberman, other members of Congress, the mayor of D.C., and Agriculture Secretary Dan Glickman. Habad had to move to the new location after outgrowing several others. He mulls a question about why diplomats, administration officials, and congressmen are so available to him. "Probably they understand that it doesn't hurt for them to be seen helping," he says. On the Hill, he adds, even the non-Jewish congressmen, "like it when they see a rabbi march in from Oklahoma or Texas or something. They say, 'I'm interested in knowing what you guys do.'" Two years ago, Shemtov hosted a model Passover seder for legislators, both Jewish and non-Jewish. But overall, Shemtov limits his outreach to Jews. "We're not here to educate non-Jews about Judaism unless they ask to know. We have enough work cut out for us as it is," he says. "There are many times, however, when people who are not Jewish need explanations of why we do things, especially with all this Lieberman mania." The day Lieberman was chosen as Al Gore's running mate, Shemtov fielded 130 calls. The pace has eased, but the interest has not dissipated. Just yesterday, he says, The Washingtonian, a glossy monthly, called to find out what it would take to make the vice presidential mansion kosher. OTHERS HAVE asked how Lieberman can be pro-choice and Orthodox, or why he can't let someone drive him on the Sabbath if it is okay for someone else to turn on the lights for an observant Jew. Shemtov adds his own curiosities to the mix. "I just wonder whether they couldn't get an electric car that would have a constant current in it. Maybe if the car goes slower when he comes in, it would be like an escalator," which Jews are permitted to ride on the Sabbath, Shemtov wonders while deferring a decision to greater experts. A registered Independent, Shemtov feels gratified at Lieberman's selection. The two are friends, but he admits he has not yet decided how he will vote. He adds: "I feel relieved that America finally broke the barrier, and I'm further relieved that they broke it with someone who is visibly and obviously very committed to Judaism." American Friends of Lubavitch was founded a quarter-century ago under President Gerald Ford. In 1978, President Jimmy Carter proclaimed the rebbe's birthday, the 11th day of Nissan, "Education Day." And in 1995, Schneerson, after an exhausting push by Shemtov and others, became the first religious leader ever to be awarded America's highest civilian honor, the Congressional Gold Medal. "I consider him part of us. If we could make him an honorary member of Congress, I would," says seven-term Democratic Congressman Benjamin Cardin. "I've never met a person more upbeat, more uplifting than he is. He's a person who is always there, always reminding us how we can enjoy our religion, even on the most difficult days on Capitol Hill." Asked if despite all of his recognition among legislators and diplomats he ever gets curious looks from pedestrians around town who are not as accustomed to seeing Orthodox Jews as New Yorkers, Shemtov says with a wink, "I try not to look like a schlepper. You have to remember you are an ambassador of your people wherever you are." " 'So that you remember the day you came out of Egypt all the days of your life':... 'The days of your life' signifies this world; 'all the days of your life' includes as well the Days of Mashiach"
The Exodus from Egypt represents the mode of avodah called iskafya - the suppression of evil; the future Redemption represents the mode of avodah called is'hapcha - the transformation of evil. At the time of the Exodus, the Jewish people were not yet refined; "the evil in the [animal] souls of Israel was still strong." They therefore had to flee from the evil and impurity of Egypt; as it is written, "for the people fled." This is an avodah of iskafya. At the time of the future Redemption, however, the spirit of impurity will be removed from the earth. Concerning that time, therefore, it is written, "You will not go out in haste." The avodah at that time will thus be in a mode of is'hapcha. One might ask: Since the avodah of is'hapcha (through which evil is altogether nullified) is higher than the avodah of iskafya, why should one continue to speak of the Exodus from Egypt at the time of the future Redemption? The answer lies in a certain respect in which iskafya is superior to is'hapcha, for the individual practicing it toils and battles and suppresses the evil within him. In other words: At the core of is'hapcha lies yichud (lit., "unification") - the individual becomes unified with Divinity by means of his self-purification; at the core of iskafya lies bittul (lit., "nullification") - by nullifying his own will, the individual compels himself to serve his Maker. This is why even at the time of the future Redemption we will continue to speak of the Exodus from Egypt. For the Divine intent is that both modes of spiritual service be practiced - on the one hand, yichud by means of self-purification, and on the other hand, bittul by the humbling of self. "There will be no difference between the current age and the Era of Mashiach except [our emancipation from] subservience to the [gentile] kingdoms"
Whoever does not believe in hashgachah peratis, the involvement of Divine Providence in every aspect of this world, is enslaved to the kelippah, which covers and conceals Divine Providence. This is the inner meaning of "subservience to the [gentile] kingdoms." In the future, however, when the spirit of impurity will be removed from the earth, this Providence will become manifest; at that time, everyone will see how every single occurrence derives from G-d.
"In the time to come... [the Jewish people] will say [to Yitzchak Avinu]: 'For you are our father.' "
The name Yitzchak implies laughter, and hence, delight. In the time to come, when all the sparks of Divinity embedded in the material universe will have been uncovered and elevated, G-d's delight at the completion of this task will become manifest. "In this world, [the Divine Name] is written [with the four letters of the Name Havayah which begin with] Yud and Hei, but is pronounced with the Name [which begins with the letters] Alef and Daled; in the world to come, however,... [the Divine Name] will be [both] written with Yud and Hei [etc. ], and pronounced with Yud and Hei [etc.]" And I appeared unto Abraham, unto Isaac, and unto Jacob, by the name of God Almighty, but by my name JEHOVAH (YVWH) was I not known to them. When Mashiach comes, there will a revelation of the level of Divinity which transcends nature. The Divine Name will therefore be pronounced as it is written, for then, the entire universe will be irradiated by the Name Havayah, which transcends time and place. For this Name is a composite of hayah and hoveh and yihiyeh, inasmuch is G-d Himself "was, is, and will be, simultaneously." The irradiation of the Name Havayah throughout the entire universe at that time will resemble the revelation that in former times pervaded the Beis HaMikdash. The Midrash determines according to the view of R. Yehoshua, that the time of the Redemption is the month of Nissan. For Nissan is a time of Chessed, whereas Tishrei is a time of Gevurah, a time of judgment. According to the view of R. Eliezer, our people will be redeemed in Tishrei. The month of Tishrei, when we pray for rain, represents a direction in divine service wherein that which is below is uplifted, for rain is granted as a response to "an arousal from below"; as it is written, "A mist rose from the earth." The month of Nissan, by contrast, represents a direction in divine service wherein that which is above is drawn downward; in this month we pray for dew, which is granted on the initiative of "an arousal from above." At the time of the Exodus from Egypt, the people of Israel were enmeshed in the 49 Gates of Impurity. Nothing less than a revelation from above could release them from this state. And in fact, "The supreme King of kings was revealed over them, and redeemed them." That is why this redemption took place in Nissan, which is characterized by the direction in divine service wherein that which is above is drawn downward. The future Redemption, by contrast, will follow in the wake of our service of G-d through the study of Torah and the observance of mitzvos. This service refines the world and transforms it into a vessel for Divinity. (For, as is explained in Chassidus, the Giving of the Torah heralded a new world order, (Shavuot May 25-27, 2004) whereby the loftiest of spiritual revelations, even those of the future Redemption, are intimately integrated into this world.) That is why this Redemption will take place in Tishrei, which is characterized by the direction in divine service wherein that which is below is uplifted. This will take place by virtue of the above-mentioned integration of the Divine light within the very fiber of this world (despite the fact that when divine service takes the direction of haalaah, an inferior level of light is evoked). R. Yehoshua holds that the future Redemption will take place in Nissan, since it will be initiated from above. Nevertheless, since the light of this Redemption will be integrated within this world, we will gain the advantages of both sides. "In the time to come, G-d will bring the Evil Inclination and slaughter it"
This shechitah - slaughtering for kosher consumption - implies the removal of the evil within the Evil Inclination, so that what is left is a holy angel. In this way, the "scoundrel" is transposed and transformed into "a white one". Why should the Evil Inclination be slaughtered? Was he not created in order to carry out his task? The answer is that he will be punished for having posed as the Good Inclination, deluding a sinner that he is fulfilling a mitzvah. In this light we can understand the following verse: "The words of his mouth are iniquity and deceit; he has ceased being wise and doing good." [As explained here, the subject of the first part of the verse is the Evil Inclination; the subject of the second part of the verse is his prey.] The Evil Inclination deceives a man ("The words of his mouth are iniquity and deceit"), by explaining to him that the sin he has just done is in fact a mitzvah. As a result, it does not occur to this man to repent ("he has ceased being wise and doing good"), for no man chooses to repent over the mitzvos he has done. Just as it is impossible to gaze upon the sun because of its intense brightness, and one needs a protective screen, so too the intense radiation of the Divine Name Havayah must be screened and attenuated by means of the Name Elokim, which is numerically equivalent to "nature". In the future time, however, G-d will unsheath the "sun" (i.e., the Name Havayah) from its "sheath" (i.e., the obscurity of the Name Elokim). "The tzaddikim will be healed by it": They will experience the promise of the verse, "Your eyes shall behold your Teacher." G-d will relate to the tzaddikim on a supernatural level, and they will be enabled to receive His intense brightness and His abundant mercies. "...and the wicked will be burnt by it": For them the attribute of Divine mercy, as expressed by the Name Havayah, will be transformed into the attribute of stern justice; as it is written, "G-d will go forth like a warrior." This banquet, as is explained in the literature of Chassidus, is replete with spiritual allusions: the Livyasan, the Wild Ox, the "preserved wine," - each has its profound mystical significance. At the same time, however, this will also be a physical banquet. "May it be Your will... that the Beis HaMikdash be speedily rebuilt in our days, and grant us our portion in Your Torah"
What is the connection between these two requests? When the Beis HaMikdash is rebuilt, we will see the fulfillment of the prophecy, that "strangers will stand and pasture your flocks." And when that happens, every Jew will able to devote himself exclusively to the study of the Torah. "The harp of theBeis HaMikdash had seven strings..., and the harp of the Days ofMashiach will have eight"
The word for harp - kinor - is made up of the letters chof vov ner. The first two letters signify 26, which is the numerical equivalent of the Divine Name Havayah; the last two letters comprise the word ner ("lamp"), for the soul is called "a lamp of G-d." The word kinor thus alludes to the spiritual light of the Name Havayah that shines into the soul. This takes place in either of two modes. The kinor of seven strings signifies an elicitation of the Name Havayah in the manner in which it is revealed within the seven Supernal attributes. The kinor of eight strings, by contrast, signifies the revelation of the Name Havayah in a manner which transcends the seven Supernal attributes. This mode of revelation transcends the limitations of Hishtalshelus, the chainlike downward progression whereby the ethereal, pristine, spiritual light undergoes successive stages of self-imposed screening and condensation. Our Sages teach that in future time the Name of the Holy One, blessed be He, will be read as it is written, whereas now its pronunciation (the kri, viz., Ad-nai) differs from its spelling (the ksiv, viz., Havayah). The ksiv represents the realm of Divine self-concealment; the kri represents the realm of Divine self-revelation. In future time, when the Name of G-d will be read as it is written, these two realms will unite. The harp of the Days of Mashiach will thus have eight strings: the four letters of the Name Havayah, which represents the self-concealment of the ksiv, will shine forth and be revealed within the four letters of the Name Ad-nai, which represents the self-revelation of the kri. The number eight has two opposite connotations. On the one hand, it indicates a Divine dynamic that transcends the created universe, which is programmed in cycles of seven. On the other hand, the number eight is not self-sufficient, but continues from the number seven which precedes it. These two polar opposites will be reflected in the future revelation of the glory of G-d. On the one hand, the glory of G-d as then revealed will be incomparably superior to the created universe. At the same time, however, the glory of G-d will become manifest in such a way that the material world will "see" Divinity by virtue of the world's own nature (and not because the infinite nature of Divinity enables it to become revealed even to material flesh). This means that the mitzvos in their present form will be of no account relative to the revelations of the future. The degree of Divine energy elicited by the performance of a mitzvah today is infinitely inferior to the degree of Divine energy that will be elicited by the performance of a mitzvah in the future. In the present, the Torah is garbed in narratives - the story of Lavan, the story of Bilam, and the like. In the time to come, however, the mysteries hidden in these narratives will be disclosed: it will become apparent how these stories in fact speak of G-d, of the building of supernal worlds. This is why G-d says that at that time the Torah will go forth from Me: the way in which the entire Torah speaks of G-d will then be revealed. This "new Torah" too was given at the Giving of the Torah at Sinai, for the Giving of the Torah will never be repeated. The "new Torah" is no real innovation, but simply the revelation of that which had been concealed. It will be noted that the verse specifies that it will proceed from Me, and will thus not be an accomplishment of the King Mashiach. This is a subject on which much remains to be said. The KingMashiach is destined to come from the north, as it is written, "I have aroused [him] from the north and he has come"
Specifically the north - concerning which it is written, "From the north will the evil begin" - is related to the coming of Mashiach. For the coming of Mashiach will mark the completion of the refinement and elevation of this "north", the transformation of the evil itself to good. As it is written, "And night will illumine like day." The "north" itself will diffuse light. One of the towns in the north of Eretz Yisrael is the holy city of Tzfas (Safed), and it has a specific connection with the coming of Mashiach. The King Mashiach will be revealed in the Galilee, and Tzfas is one of the Galilean towns. It was in Tzfas that the revelation of the innermost, mystical dimension of the Torah began (through the AriZal and his disciples). As is well known, this unveiling of the pnimiyus of the Torah is a preparation and a prelude to the teachings of Mashiach, which constitute "the secret reasons and the hidden mysteries" of the Torah. The very name Tzfas derives from the root that appears in the phrase, tzafah hatzofis - "Look far, O watchman!" This concept characterizes the future Redemption, when "together all flesh shall see that the mouth of G-d has spoken." "The Torah that a man studies in this world is meaningless relative to the Torah teachings ofMashiach"
It is thus evident that the study of Torah in this world is no more than an educational preparation for the study proper that will take place in time to come. Indeed, studying Torah in this world grants one the merit of studying the Torah teachings of Mashiach. This concept enables us to understand why the very first law detailed in the Hilchos Talmud Torah of the Alter Rebbe, instead of stating that an adult is obliged to study Torah, is the following: "It is a positive commandment explicit in the Torah that a father teach his young son Torah." Why this precedence?
" Let his Blood Be On Our Hands and Our Children's Hands"
There is a hint here - that the entire study of the Torah in this world is essentially chinuch, an educational preparation, like the studies of a little child. "In time to come, when the Divine Name is among [the Jewish people], [contact with a niddah] will not be forbidden"
Concerning the future time it is written, "I shall remove the spirit of impurity from the earth." Accordingly, in a verse which speaks of remaining silent from Torah study, the initial letters of this phrase spell the word nidah - and this state of impurity will be reversed in the future, for at that time, "together all flesh shall see that the mouth of G-d has spoken." At that time, therefore, the prohibition concerning the state of niddah will not apply. Underlying this prohibition is the fact that Chavah (Eve) shed Adam's blood. In the future this will be remedied, for Mashiach will be at the level of Adam before the sin of the Tree of Knowledge. This is hinted at in a verse describing Mashiach: "He shall be exalted and extolled, and very lofty." When transposed, the letters that spell meod spell Adam. "All the festivals will be annulled in future time, except for Purim"
"The Land of Israel is destined to spread forth over the whole world"
Outside the Land of Israel, the flow of Divine energy descends from the World of Atzilus (Hell) by being successively vested in the Worlds of Beriah, Yetzirah and Asiyah. In the Land of Israel, by contrast, this flow is drawn downward by being successively vested in the Worlds of Beriah and Yetzirah alone. From that point it proceeds to descend - (To the PIT, the Abyss) by way of the angel which presides over the World of Asiyah and which has dominion over Eretz Yisrael - as an untrammeled transient through the World of Asiyah, rather than being involved and vested in it. The flow that reaches Eretz Yisrael thus relates back to the World of Yetzirah, whereas the flow that reaches the lands of the Diaspora relates to the World of Asiyah. This explains the ritual impurity of those lands, as determined by the Sages, for in the World of Asiyah the Divine light is thickly screened by kelippos. In the future, however, when the world is refined and all kelippos are annulled, nothing will obstruct Divinity. The lands of the Diaspora will thus also be refined, and will become elevated to the level of the Land of Israel. In this sense, then, "The Land of Israel is destined to spread forth over the whole world." "The generations will be redeemed only in the merit of the righteous women of each generation"
This teaching is also true of our forefathers' redemption from Egypt. Since this redemption took place for the sake of the Giving of the Torah at Mt. Sinai soon after, the women were given precedence at that time. This is seen in the comment of Rashi on the verse, "Thus shall you say to the House of Yaakov (Rashi: 'This refers to the women') and speak to the Children of Israel" (Rashi: 'This refers to the men')." The same will be true of the future Redemption: since it will come about in the merit of the righteous women of Israel, they will likewise be shown precedence with regard to the Torah teachings of Mashiach, concerning which it is written, "A renewed Torah shall go forth from Me." This parallel is reinforced by the teaching that our generation is a reincarnation of the generation that was redeemed from Egypt. "[In time to come] all the Prophetic Books will be annulled, except for the Scroll of Esther"
This means that the Divine light that is revealed by means of prophecy will be so dim, relative to the intense light that will be revealed in time to come, that it will be as insignificant as a mere ray of sunlight relative to the sun. This does not mean (heaven forfend) that prophecy will cease among Israel. On the contrary, we have G-d's promise that in future time "I shall pour My spirit upon all flesh, and your sons and your daughters shall prophesy." This refers to the first stage within the time to come, when the categories of "forbidden" and "impure" will still exist. Only then will the pig be rendered pure. After this stage, however, with the fulfillment of the prophecy that "I shall remove the spirit of impurity from the earth," the entire "impure Chariot" (comprising the camel, the rabbit, the hare, etc.) will cease to exist. The Zohar states that the rainbow is one of the signs of the future Redemption. What is the connection? It has been taught that the rainbow is a sign of the purification and refinement that the world underwent by means of the Flood. Before that time the clouds were made of coarser matter, which did not reflect sunlight. After the Flood had purified the world, the clouds too became more refined: they reflect sunlight, and a rainbow is produced. In this lies the connection between the rainbow and the coming of Mashiach, for at that time the entire physical world will attain the peak of refinement. them who do not to be decapitated via Sanhedrin 57a. When Mashiach comes, such a sublime level of Divinity will be revealed that by comparison, even the lofty level of Divine Wisdom will be regarded as being as lowly as the World of Asiyah, and the Higher Garden of Eden will be regarded as being a mere wilderness. And when this sublime level of Divinity is revealed, even a tzaddik will be aroused with feelings of teshuvah. We are not speaking of teshuvah of the ordinary kind: this is not relevant to a tzaddik, for he has had no taste of sin. Teshuvah can be relevant even for a tzaddik, in the spirit of the teaching of our Sages that a person should live "all his days in teshuvah." For as soon as he wastes even a moment from his customary level of avodah in Torah study and in prayer, at that moment he is (so to speak) falling - and this calls for teshuvah. In the days of Mashiach there will be a stupendous revelation of Divinity. For G-d, who is known as "the tzaddik of the world," this revelation will be a kind of "teshuvah" - for having withheld this light from His people throughout all the years of exile. Even in the present period the avodah of tzaddikim includes an element of teshuvah, but it is different from the teshuvah that will be aroused within them by Mashiach. The teshuvah that a tzaddik experiences during the present period focuses on distance: since his body is now invested in a body, he is (so to speak) distant from G-d, by comparison with the nearness that his soul experienced before it descended to this world. For even "a perfect tzaddik, serving G-d with fear and delighting in an abundant love [of Him], will not attain the quality of his attachment to G-d... before his descent into this world." In the present, therefore, his teshuvah consists of anguish over this distance, and a yearning to restore his soul to its former ambiance. In time to come, by contrast, G-d's glory will be as manifest down here below as it is above. Since the former distance will no longer exist, the teshuvah of the tzaddik will no longer focus on distance: it will consist of an infinite love of G-d, the degree of love of which it is written, bechol meodecha - "[You shall love the L-rd your G-d]... with all your might." At present, for the most part, this degree of love is experienced most fully by a penitent, a baal teshuvah. His soul's thirst for G-d, as a result of its former distance from Him, is urgent, just as a man flees from death with his entire being. A tzaddik does not quite experience this kind of thirst. When Mashiach comes, however, G-d's Being and Essence will become manifest in this world below. This intense revelation will rouse the tzaddik to an infinite ascent, so that he, too, will become capable of the ultimate degree of love which is called bechol meodecha: at that time he, too, will be able to love G-d with all his might. It would appear that this statement intends to say that the Jewish people will do teshuvah on their own initiative, and not because heaven has compelled them to do so. The repentance will be theirs. In the two preceding chapters Rambam (Chief satanist) explains at length the concept of free choice, and then begins this chapter as follows: "Since every man has been granted permission..., he should endeavor to do teshuvah and to confess." His intention may be understood as follows: A man should endeavor to undertake truthful teshuvah, i.e., teshuvah that springs from his own free will (rather than wait until he is coerced from above to do so). It is immediately after this that Rambam writes that "ultimately the Jewish people will repent": they will do this kind of teshuvah, that which is freely chosen. Nine Red Heifers were prepared...: the first was prepared by Moshe Rabbeinu, the second by Ezra, and there were seven from the time of Ezra until the Destruction of the [Second] Beis HaMikdash. The tenth will be prepared by the King Mashiach - May he speedily be revealed! Amen, may this be G-d's will! Now why should Rambam have chosen to place this closing prayer for the coming of Mashiach specifically here, among the laws of the Red Heifer? By way of explanation: The era of exile shares the state of impurity which is imparted by contact with a corpse. In addition to the simple sense of this kind of impurity, which today we are all presumed to have contracted, this is also the spiritual content of the state of exile. For the exile was brought about by the sins of Israel, by a lack in the fulfillment of the verse, "You who cleave to the L-rd your G-d...." As a result, there is also a lack in the fulfillment of the continuation of the same verse, "You are all alive today." And the ash of the Red Heifer, by means of which a person who has become defiled is cleansed of the impurity contracted by contact with a corpse, alludes to the future Redemption, for it will remove the analogous kind of impurity. The death of Christianity, or the "Judeo-Churchizionity, the saints of Christ live forever. RAFAH -- The tiny hole buried under Asma Mughayar's thick black hair, just above her right ear, is an illusion, according to the Israeli army. So is her family's insistance that Asma, 16, and her younger brother Ahmed, were both shot through the head by an Israeli soldier as they fed their pigeons and collected the laundry from the roof of their home in Rafah refugee camp. But their corpses tell a different story, as do the bodies of other children brought to Rafah's hospital and makeshift mortuaries even before yesterday's carnage, in which Israeli tanks and helicopters fired on a peaceful protest by Palestinians in the camp, killing 10 demonstrators, according to Palestinian paramedics. Israel disputes the Mughayar family's account: that soldiers shot the children on Tuesday. Hours after their death, Israeli officials blamed the Palestinians, telling reporters that Asma and Ahmed had been killed in a "work accident" - a euphemism for bomb-makers blowing themselves up - or by Palestinian fighters who had left a landmine in the street. "A preliminary investigation indicates they were killed by a bomb intended to be used against soldiers. It was set outside a building by Palestinians to hit an Israeli vehicle. This is probably what happened," a military spokesman said yesterday. Dr Ali Moussa, head of Rafah hospital, is as furious at the claim as he is at Israel's assertion that almost all the 20 or more people killed during the army's seizure of the Tel al-Sultan district of the Rafah refugee camp were armed men. "They are liars, liars, liars, because these children have bullet wounds to the head. There is no doubt about it," he says. "The Israeli propaganda is that they were killed in a work accident. These are the kinds of lies they tell all the time," he says. "They say all the dead are fighters. They say they do not deliberately kill children, but about a quarter of the dead from the first day of shooting are children. The evidence is here in the morgue. Does this girl look as if she was blown up by a bomb?" Asma's body lies in the hospital mortuary unburied, like all the other dead from Tel al-Sultan, because their relatives are trapped in their homes by a curfew. Her 13-year-old brother's corpse is a short drive away in the cold-storage room of an Israeli-owned flower-growing company. "This is what the Israelis claim is a 'work accident'," Dr Nkaria says. He points to the corpse of another youth in the cold-store. "This is Ibrahim Alqun. He is 14 years old. He was shot in the back of the head. The bullet came out of his right eye," he says. The child's face is badly mutilated by the wound. Dr Nkaria's finger probes a tiny hole in the small child's back which masks the devastation done to his heart as the bullet shot through it. "No one can say this child was a fighter. Look at the size of him and look where they shoot him - in the back, not coming to attack someone," the doctor says. "My brothers only went out for water," Ayub says. "We heard the gunshots and I went to their rescue. They were both lying there bleeding and I was shot in the arm. "We tried to pull Yousef to the house, but we couldn't and he lay there bleeding for half an hour until the ambulance came." Other children are luckier. Twelve-year-old Ahmed Hussein looked out of his window in Tel al-Sultan on Tuesday afternoon. A sniper's bullet hit him in the shoulder. The bullet passed through a fleshy part and hit his aunt in the hand. "I thought the Israelis had withdrawn. I went to the window to see. I wanted to get out of the house and they shot me," he says in his hospital bed. Hamas' armed wing, the Ezzedine al-Qassam Brigades, issued a statement saying it was ready for a fight to the death. Israeli Defence Minister Shaul Mofaz said that no time limit had been set for "Operation Rainbow" that was designed to smash tunnels used to smuggle in weapons from under the border with neighbouring Egypt. However, after speaking to many rabbis, it is clear that Lior's views and interpretation of Jewish Law enjoy far more popularity and acceptance than Froman,s relatively dovish interpretations. Lior praised Goldstein, calling him a "great saint and rabbi may his memory be blessed". Several months after the massacre, Lior told disciples in Kiryat Araba near the occupied West Bank city of Hebron "Jewish blood was redder than non-Jewish blood and that a Jewish life is preferred by the Lord than a non-Jewish life". Mirkaz Ha'rav officials in West Jerusalem (the main religious College where Dov Lior teaches) refused to comment on Lior's edict when contacted by Aljazeera.net. House Joint Resolution 104, Public Law 102-14 US Congress 1991, ....Death by Decapitation....to any who refuse the god's, the shem's hoodlum haba and them who stand firm in the witness of Jesus the Christ...... gawd bless Amaraka ! Let this rabbi and all his Illumined masters of Talmud Bavli see the Thief in the Night, on that Great Day of the Lord's wrath........How Long O Lord doth thou give vengeance upon them who are responsible for ALL who are slain upon the earth from Abel to the Prophets to the Lord's Crucifixion, unto His saints. The rest of you...........go back to your Judeo-Churchi-zionian slumber, for that day will indeed visit you unawares, unless you REPENT in the Name of the LORD Jesus the ONLY IAM. WASHINGTON (CNN) -- The FBI is warning state and local partners to be on the alert for suicide bombers. The bureau says there is no hard intelligence warning of any plans by terrorists to launch suicide attacks in the United States, but wants those on the front lines in the war on terror to be aware of such a threat. In its weekly bulletin distributed to 18,000 agencies, the FBI says to look out for people wearing bulky jackets on warm days, smelling of chemicals, or even individuals whose fists are tightly clenched. The bulletin also says suicide bombers may disguise themselves in stolen police uniforms or even as pregnant women. Headline news.....Dark complected man with black beard caught disguised as a pregnant white woman from the Bronx...new report from Israeli Mossad. The FBI has warned before of possible suicide bombings, but officials tell CNN extremist rhetoric following reports of abuse at Iraq's Abu Ghraib prison, as well as concern over several special events coming up in the United States, have renewed concern. Those special events include the official opening of the World War II memorial in Washington, the July Fourth holiday and the Democratic and Republican conventions. Officials say suicide bombers are often impossible to detect. There is usually no advance intelligence and so-called soft targets such as shopping malls are nearly impossible to protect from such an attack. ISRAEL provoked an international outcry yesterday after a military raid in the Gaza Strip killed at least 19 Palestinians, at the same time as George W Bush praised his ally's "skill and heroism". Hours after the attack on the Rafah refugee camp began, the US president said Israel had "every right to defend itself from terror". was launched after militants killed 13 soldiers there last week, the biggest blow to the Israeli army in two years. The operation will continue for a week, (seven days) Israeli officials said. Before the ground assault, Israeli helicopter gunships killed seven Palestinians, at least three of them gunmen and another a civilian, outside a mosque, witnesses said. The Rafah hospital morgue became so overloaded that five bodies were shifted to vegetable freezers in a nearby market for preservation, staff said. Palestinian medics said soldiers held up ambulances trying to evacuate wounded. The army said it gave passage to all emergency service vehicles once roads were secured. Troops demolished four houses, according to people in the camp. Amid mounting international condemnation, which in-cluded the United Nations and European Union, the US said it was asking Israel for "clarification" about the offensive. However, speaking earlier in an address to the American Israel Public Affairs Committee, a powerful lobby group in Washington, as part of a tight election campaign, Mr Bush called Israel a democracy and a friend. He said the Gaza bloodshed was "troubling", but saved his fiercest criticism for the Palestinian leadership, laying down the action it must take to secure peace. Mr Bush said: "First, the Palestinian people must reject corrupt and failed leaders, and insist on a leadership committed to reform and progress and peace. Second, they must renounce terror and violence that frustrate their aspirations and take so many innocent lives." To cheers from the 4500-strong audience, Mr Bush also re-iterated support for Ariel Sharon, the Israeli prime minister, calling his commitment to withdrawing from Gaza and parts of the West Bank "a bold, courageous step". He added: "Again and again, Israel has defended itself with skill and heroism. These ties have made us natural allies and these ties will never be broken." The raid drew fierce criticism from Arab states, which branded the demolition of homes a war crime and promised to start judicial steps to bring Israelis to trial. Amnesty International, the human rights group, said the demolition and destruction were "grave breaches of the fourth Geneva convention and are war crimes". Thousands of Palestinian houses have been razed since they began a revolt in occupied territory in 2000, according to UN figures. Amnesty claims Israel has destroyed more than 3000 since 2000. However, Israel's ambassador to the US said some Palestinians damaged their own houses to make it look like the work of the Israeli army. Daniel Ayalon said they have removed roofs from 30 homes so they could seek compensation from the Palestinian Authority or international aid groups. The Israeli army said there were no plans for any systematic demolition during the operation, which aimed to stop the smuggling of weapons through tunnels from Egypt. A White House spokesman said it was in touch with the Israelis on the humanitarian impact of their incursion and was assured the goal was to block smuggling, not level homes. Violence has worsened in Gaza since Mr Sharon (ARIK Sheinerman) proposed evacuating troops and Jewish settlers. The move has been held up by opposition in his right-wing party. US President George W. Bush on Tuesday encouraged Israel to defy the international outcry against its ethnic cleansing and war crimes in Rafah, as the United Nations Security Council was presented with three draft resolutions demanding an end to the Israeli Occupation Forces (IOF) onslaught on the southern Gaza Strip town and its refugee camps. Meanwhile, Palestinian President Yaser Arafat called for US troops to be sent into the occupied Palestinian territory to act as a buffer between the Israeli and Palestinian civil population. Early Wednesday, the Palestinian death toll in Rafah rose to 24, including a brother and sister aged 13 and 15. The toll is the highest in one day since at least 25 Palestinians were killed in the West Bank city of Ramallah on April 5, 2002, when the IOF reoccupied all of the West Bank, par the oasis town of Jericho. The IOF Chief of Staff Moshe Ya’alon said only nine of those killed in Rafah were known “wanted” anti-occupation activists. In the West Bank, IOF shot dead Mohammad Hussein Al-Turkman, 22, in Jenin early Wednesday, WAFA reported. On Tuesday, IOF troops shot dead two more in the West Bank, namely Nidal Abdul-Rahman Okasha, 24, from Nablus and Mohammad Ahmad Obaid, 24, from the village of Anza, near Jenin. President Yaser Arafat called for the intervention of US troops to serve as a buffer between the IOF and Palestinian civilian population. “Mr Arafat asked for US troops to come and intervene,” Anne-Marie Lizin, head of the Belgian senate’s foreign affairs committee, said in a radio interview. “I said to him: ‘Don’t you mean international troops?’ and he repeated: ‘No, today the only thing that is useful and will be efficient quickly would be to ask for US troops’,” she said. Arafat described the Israeli invasion of Rafah as a massacre. “What is happening in Rafah is a large massacre which has been planned, and they (the Israelis) are saying it will continue,” Arafat told reporters at his West Bank headquarters after a meeting with locally-based foreign diplomats. “The murders, the destructions and the (population) transfers cannot be tolerated by the Palestinians or by the international community,” Arafat added. Separately, the Palestinian leadership on Tuesday urged the international community to interfere with Israel to stop the “brutal massacre” in Rafah. “The Palestinian leadership calls on the US, the Quartet, the Arab brothers, the European Union and the UN Security Council to stop this massive brutal massacre perpetrated by the Israeli government,” it said in a statement released by the official news agency WAFA. The PLC (parliament) issued a statement calling on the United Nations “to break its silence over Israel’s war crimes and state terrorism” and “intervene immediately to stop the aggression on Rafah,” WAFA reported. However, Israel’s “Defense” Minister Shaul Mofaz vowed the offensive, dubbed “Operation Rainbow,” would continue for as long as possible, according to the Ha’aretz daily. “Nobody can approach this area. The Palestinians in Rafah are living in hell,” he said. UN spokesman Fred Eckhard said recent reports from UN agencies found that some 2,197 people have lost their homes in the first 15 days of May. “The United States is strongly committed, and I am strongly committed, to the security of Israel as a vibrant Jewish state. Israel is a democracy (LOCKED IN A COMMUNE COMPOUND WALL) and a friend, and has every right to defend itself from terror,” he said. “The unfolding violence in the Gaza Strip is troubling and underscores the need for all parties to seize every opportunity for peace,” he said in a speech to the American Israel Public Affairs Committee (AIPAC), a powerful pro-Israel group. Baby out with the baath water? Later, White House spokesman Scott McClellan said the United States “understood” Israel’s reasons for the raid in the refugee camp of Rafah, which it alleged was to smash tunnels used to smuggle weapons under the border with Egypt. “The Israelis have told us (hehehheheehehhoooooooohoeeeeeee) they will make every effort to minimize the impact on Palestinians not involved in acts of terrorism or arms smuggling,” McClellan told reporters. US State Department spokesman Richard Boucher also said Israel had offered explanations in response to urgent US queries after IDF troops demolished nearly 90 homes in Rafah last week. Meanwhile, the UN Security Council was presented with three draft resolutions demanding an end to the Rafah raid, AP reported. Arab nations introduced a Security Council resolution demanding that Israel stop the demolition of homes in the Rafah refugee camp in the Gaza Strip. Yemen’s UN Ambassador Abdullah Alsaidi, the current chairman of the Arab Group, called on council members to take “necessary measures” against Israel for violating international law. The Arab text, introduced by Algeria, the only Arab nation on the council, would condemn “the recent large scale demolition of homes committed by Israel” in Rafah. He said the demolition of homes is “collective punishment,” which he called “a war crime,” and he urged the Security Council to condemn the practice and demand that Israel stop violating international law. The United States proposed major amendments aimed at balancing the resolution introduced Tuesday. The US draft would call on Israel to respect its obligations under international law, “including its obligation not to undertake demolition of homes as a punitive measure.” It would also call on the Palestine National Authority to take “immediate action” against so-called terrorist groups and end the alleged smuggling of illegal weapons into the West Bank and the Gaza Strip. Britain’s UN Ambassador Emyr Jones Parry offered separate amendments, also aimed at creating a better-balanced text, which he said were “some distance” between the American and Arab texts. Both Jones Parry and Germany’s UN Ambassador Gunter Pleuger said after a closed meeting that the Security Council would like to reach agreement on a resolution. “We had a good beginning today and there's every chance we can get to consensus. We hope so at least,” Pleuger said. Jones Parry and Pleuger predicted there would be a vote on a resolution on Wednesday. The Rafah refugee camp is a densely-populated home of 90,000 people, all refugees and their descendents who were forced out of their historical homeland by Zionist paramilitary gangs to make way for the creation of Israel in 1948. Israeli “Operation Rainbow” along the Gaza-Egypt border has sparked a growing international outcry. The United Nations and the European Union have demanded an immediate end to the invasion and Amnesty International has accused Israel of war crimes as well as breaching the 4th Geneva Convention. Palestinian refugees in the camp refuted this Israeli justification to demolish their homes. They indicated that the western Tel Al-Sultan neighborhood of the Rafah refugee camp, where the IDF onslaught is concentrated, is separated from the border with Egypt by the illegal Jewish settlement of Morag and is more than one and half kilometers far from the border line. IDF troops were in control of the Tel Al-Sultan neighborhood early Wednesday, a senior IDF officer said. “The Israeli forces are occupying an UNRWA school with tanks,” Lionel Brisson said. “The people are locked in their homes, hiding from the heavy fighting,” adding that about 15,000 people were under curfew in Tell Al-Sultan. No ambulances were being allowed inside the quarter, he said.